Live music plus other fun surprises for the kids! Mall Perks Members: attending this event will earn you 100 points! Stop by Customer Service the day of the event to add them to your account*. Not a member? Sign up for free today and start earning points toward FREE mall gift cards! *Please note: we cannot add event attendance points after the day of the event. 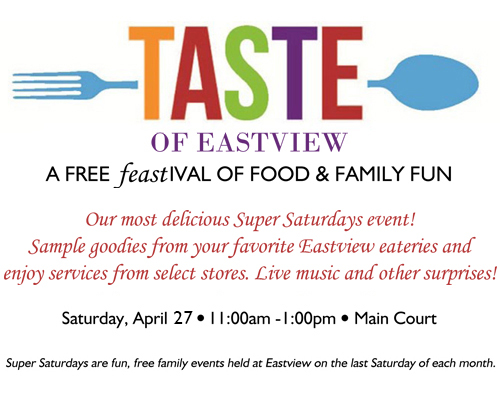 Super Saturdays are fun, free family events held at Eastview on the last Saturday of each month. Be sure to keep an eye on our calendar to see what else we have planned and follow us on Facebook, Twitter and Instagram (or download our mobile app) for the latest event information!